Governor Abdullahi Ganduje of Kano State. 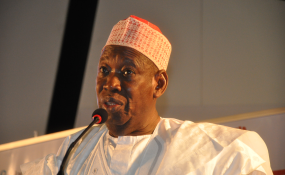 The police and the Economic and Financial Crimes Commission (EFCC) have both said they cannot immediately swing into action to unravel the circumstances surrounding a series of scandalous videos that seemed to show Governor Umar Ganduje taking bribes from public works contractors in Kano State. The initial clip of the alleged bribe tapes surfaced online Sunday afternoon, eliciting nationwide uproar and urgent calls for Mr Ganduje to step down from office. A second batch of the videos was published Monday afternoon by Daily Nigerian, a news website which published the first video and said it has up to 15 of such clips seemingly showing the governor taking bribes from different state contractors. Daily Nigerian said it plans to release all the 15 video clips of Mr Ganduje's allege bribery schemes, which he said were shot over several months. Mr Ganduje has not commented on the second video, but he dismissed the first one as 'cloned' and threatened a lawsuit against Daily Nigerian, whose publisher has since gone underground to avoid violent backlash against him and his family. Neither the police nor the EFCC publicly announced any probe into the videos, even though their contents were first published a week ago before clips started streaming in yesterday. "If they are talking about issues, let them resolve their issues," Wilson Uwujaren, a spokesperson for the EFCC, told PREMIUM TIMES Monday afternoon. "Whether we are going to look at it is a different matter, but for now, I do not know anything." He declined to categorically say whether or not an investigation would be conducted into the scandal. The Kano police commissioner, Rabiu Yusuf, also had nothing substantial to say about the videos when reached for comments by PREMIUM TIMES Monday afternoon. "I am in Abuja, I have not seen the video not to talk of even investigating," the commissioner said. "I am not in town so I do not know anything pertaining to that for now." "But do not worry, when I am done, I would call to let you know," he added. Mr Ganduje is a member of the ruling All Progressives Congress. It was not immediately clear whether or not that is a real factor in the scandal, although federal authorities have been accused of only going after opposition figures under the current administration. President Muhammadu Buhari was reported by Daily Nigerian to have seen the video and ordered investigation, but it remains unclear whether law enforcement authorities have updated the president on their efforts, if indeed they have started investigations. The governor has absolute immunity from prosecution, a constitutional provision that could have him retain office unless he is compelled to resign or gets impeached by the state parliament. Daily Nigerian reported earlier on Monday that members of Kano State House of Assembly have raised a committee to commence a probe of the videos.